The Eastern Orthodox Church dates its existence from the time of Christ and the Apostles. The Apostle Peter founded the church in Antioch, which exists to this day as the Antiochian Orthodox Church. The spiritual head of this church today is Patriarch Ignatius IV, who represents an unbroken line of patriarchs descending directly from St. Peter. The spiritual head of the Antiochian Archdiocese in North America is Metropolitan Philip, whose headquarters is in Englewood, NJ. St. George church of Little Falls is a member of this Archdiocese. Other early churches were established in Greece, Jerusalem, Alexandria, and Cyprus. Later, missionaries brought the church to other orthodox countries, such as Russia, Ukraine, Serbia, Romania, etc. This self-governing family of churches is known today as the Eastern Orthodox Churches. 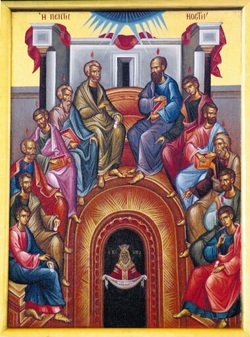 The Orthodox Church is apostolic, because it teaches what the apostles taught, and its history can be traced through its bishops directly to the apostles and to Christ. 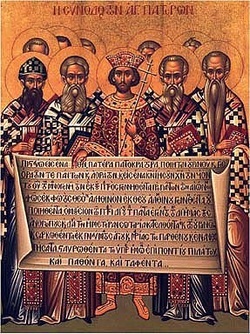 So, the Orthodox Church is the legitimate and historical continuation of the first church, founded by the apostles. The Orthodox Church has preserved the full and true faith of Jesus Christ, without adding, or subtracting from it. Our Church service is called "Liturgy", and it celebrates the joy in the Resurrection of Christ. We make extensive use of icons, which are religious paintings of Christ, and the Saints. The highest earthly authority of our church is the Ecumenical Council, whose membership are the Bishops of the church, representing all of the people of the church. When they define a matter of faith, the lay people of the church, as a whole must accept, otherwise it is not binding. Thus, the Orthodox Church preserves the "Wholeness" of the church, as Christ intended. Orthodox Christians believe that through Jesus Christ, the only begotten Son of God, God chose to get close to us, embrace us, and show His love for us. The foundation of Orthodox Christianity is that Jesus Christ is the incarnation of the invisible God. To learn more about our faith please contact Father Dimitri Darwich. The Nicene Creed is the statement of faith in the Church and was formulated at the First Ecumenical Council of Nicea in 325 AD.
" I believe in one God, the Father Almighty, Maker of heaven and earth, and of all things visible and invisible; And in one Lord Jesus Christ, the Son of God, the Only-begotten, Begotten of the Father before all worlds, Light of Light; Very God of Very God; Begotten, not made; of one essence with the Father, by Whom all things are made; Who for us men and for our salvation came down from heaven, and was incarnate of the Holy Spirit and the Virgin Mary, and was made man; And was crucified also for us under Pontius Pilate, and suffered, and was buried. And the third day He rose again, according to the Scriptures; And ascended into heaven, and sitteth at the right hand of the Father; And He shall come again with glory to judge the quick and the dead, Whose Kingdom shall have no end. And I believe in the Holy Spirit, the Lord, the Giver of Life, Who proceedeth from the Father; Who with the Father and the Son is worshipped and glorified; who spake by the prophets. And I believe in one Holy, Catholic, and Apostolic Church. I acknowledge one baptism for the remission of sins. I look for the resurrection of the dead; And the life of the world to come. Amen."